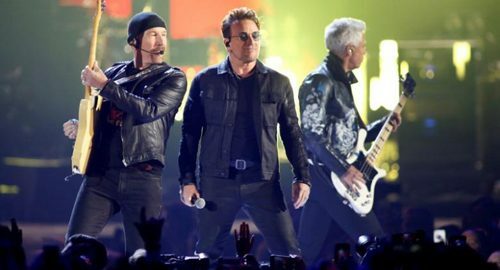 In a complaint filed on Monday night in the U.S. District Court in Manhattan, Paul Rose sought at least $5 million in damages from U2 lead singer Bono and bandmates The Edge, Adam Clayton and Larry Mullen Jr., as well as Island Records. He said this occurred at a time U2, then arguably the world’s most popular rock band, was seeking a “stark departure” from its trademark sound. Rose said he gave a demo tape of “Nae Slappin” to Island in 1989, the same year the label signed U2, and that “The Fly” incorporated its guitar solo and other elements, including distortion and “industrial-style” percussion. Rose said ordinary listeners “would reasonably find that the songs are substantially similar,” and at times so “strikingly similar” that they could not believe U2 came up with “The Fly” on its own. U2 representatives did not immediately respond on Tuesday to requests for comment. Island’s parent, Universal Music Group, a unit of France’s Vivendi SA, did not immediately respond to a similar request. It was not immediately clear why Rose waited more than 25 years to sue. His lawyer did not immediately respond to requests for comment. A jury in March 2015 awarded Marvin Gaye’s family $7.4 million for alleged copyright infringement by Robin Thicke and Pharrell Williams for their hit “Blurred Lines.” Thicke and Williams have appealed the verdict.